“What the Falklands campaign has so clearly and successfully highlighted is the value of very hard fitness training.” (Daily Telegraph, 22 June 1982). Army fitness is not athletic, but comes from training which creates robustness, resilience and endurance, plus reserves that allow soldiers to function without proper food, sleep, shelter or warmth. Soldiers must be able to live rough, not waste energy complaining, and be able to march then fight. There is no point in being able to cover the ground faster than anybody else, but arrive at the other end without the reserves to fight. Equally, there’s no point in the fitter soldiers arriving ready to fight, and having to wait for others, who may arrive late – or not at all. Military fitness is that of the lowest common denominator – the fitness of the least fit of the unit. The most important component of army fitness is morale and the willingness to fight. With this in mind, a loaded march is a rapid march over distance carrying weight and the ability to complete loaded marches is a core military skill in many countries. However in certain climates loaded marches are not practiced since they would result in high casualties through heat exhaustion. A loaded march is known as a ‘Tab’ or ‘tabbing’ in the British Army and a ‘Yomp’ in Royal Marines slang. American soldiers and marines refer to these as ‘slogs’ or ‘humps’. The pace of long marches is that of slow running, but without actually breaking into a jog – a very fast walking technique that can be difficult to get used to, especially while carrying a rifle in the ‘ready’ position, and painful on the shins. 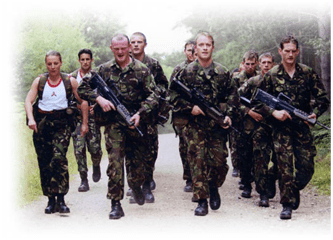 A number of fitness providers utilise the loaded march as a form of training to varying degrees. Look at The Loaded March: Preparation and Training Guide for a structured framework on loaded march training. 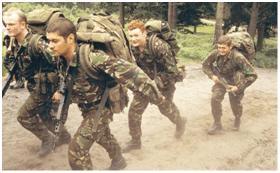 In the British Army loaded marching is considered a core skill and is tested annually in an 8 mile (12.9km) Combat Fitness Test (CFT) carrying 15–25 kg depending on the soldier’s branch of the Army. The term tab has its roots in an acronym, being an abbreviation of Tactical Advance to Battle. During the current selection process, recruits are usually made to tab 2 miles as an introduction. This is because injuries to the legs are common during basic training tabbing, due to the fact that most adolescents are un-accustomed to fitness and unconditioned for military training. The most famous yomp of recent times was during the 1982 Falklands War. After disembarking from ships at San Carlos on East Falkland, on 21 May 1982, Royal Marines and members of the Parachute Regiment yomped (and tabbed) with their equipment across the islands, covering 56 miles (90 km) in three days carrying 36 kg (80 lbs) loads. Media coverage of this war saw the term yomp become well known and in general use. A computer game called Yomp was produced by Virgin Games shortly after the Falklands conflict. However, the term has since faded somewhat from general use in the decades since the end of the Falklands war. It has been suggested that the term YOMP is an acronym (or backronym) for Your Own Marching Pace. A bacronym or backronym is a phrase constructed purposely such that an acronym can be formed to a specific desired word. Bacronyms may be invented with serious or humorous intent, or may be a type of false or folk etymology. The image of ‘the Yomper’ became one of the iconic images of the Falklands War. The original photograph was taken by Petty Officer Peter Holdgate, Commando Forces Photographer, whilst working as part of the Commando Forces News Team. After landing with 40 Commando at San Carlos, Holdgate accompanied British forces across the Falklands War zone taking hundreds of photographs. 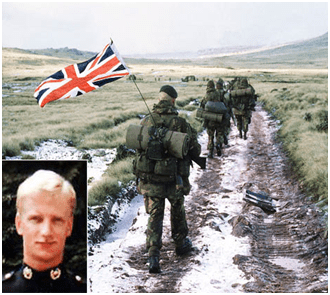 The photograph of 24-year-old Corporal Peter Robinson (right) was taken in June 1982 as the Royal Marines proceeded along the Moody Brook track towards Port Stanley. When news of the surrender of Argentine forces was received, Corporal Robinson produced a Union Flag from his pack and attached it to the aerial of his radio with masking tape. The photograph itself was entirely spontaneous and not staged. The image was used as the inspiration of a statue that was unveiled by Lady Margaret Thatcher on 8 July 1992 on the 10th anniversary of the conflict; it now adorns the entrance to the Royal Marines Museum in Southsea. Table 1 highlights the current combat fitness tests used by the British Army. ACFT (1): is based on the physical demands associated with operating in an urban environment where high levels of aerobic power (speed) are required (e.g. urban patrolling). Speed march: typically for distances <9 miles with <50lb load (excluding weapon (9lb) and water (2lb water bottle)). A fast method of moving a squad from A to B – whilst still being fresh enough to fight the enemy – and is a mixture of fast walking and running. Loaded carry: typically for distances >9 miles with >50lb load (excluding weapon (9lb) and water (2lb water bottle)). A method of moving a squad, with all of their equipment, from one base of operations to another. The above are a guide only and operational parameters, such as environmental and topological factors, will inform a commander’s decision on which method of movement (on-foot, sea-going or mechanical transport) is best. The feet and legs can only perform well if they have an adequate supply of oxygen. This is provided by the heart and lungs so general preparation is essential when any part of the body is asked to perform to its maximum efficiency. Ask too much too soon and the result will be injury and wasted time. Muscles, ligaments and bones must be strong enough to withstand the tasks asked of them. This strengthening takes time and it cannot be hurried, it must be graded progressively. Only then can the body structures withstand and tolerate physical stress. It is a misconception that you should exercise until it hurts. By avoiding stiffness there is less chance of damage, so that the training programme can proceed quicker. Tired muscles and tendons take time to recover. Try to plan for an ‘easy’ day to follow a ‘hard’ one. If time is short then exercise different muscle groups, for example, a ‘running’ day followed by a ‘gym’ day. The foot has evolved to carry man over uneven ground so it does not function well for long periods of repeated activity on hard unyielding surfaces. Initial training should take place on grass or tracks. If used too early on hard surfaces, any weakness in the foot will be multiplied by the number of strides taken and injury will result. Remember, every time the foot hits the ground it produces a force approximately equal to two and a half times the body weight so proper boots and training shoes (not cheap ‘look-alikes’) are designed to absorb shock and to support the foot in its best functional position. Running should therefore start in training shoes not boots. Numerous lower leg injuries will occur if boots are used on the unprepared foot. Boots are heavy and the muscles of the leg will take time to adjust to them. Do not expect to be able to run the same distance in the same time when they are introduced. This phase-in training means a step backwards before you can improve again. Those of you who are ‘old soldiers’ probably think that all this only applies to recruits. The same principles apply to your fitness training as well. A crash training programme to pass a fitness test will result in the same crop of lower leg injuries if running is done day after day in boots and on roads. Even the fittest and strongest body cannot withstand such punishment! Progressions of physical training are necessary in order to improve and develop physical and mental ability. However, a fine line exists between stress for progress and over-stress leading to break-down and injury. Correct planning and regular assessment should identify problems in training at an early stage. Given that loaded march performance appears to rely on a combination of strength and endurance (Kraemer et al., 1987; Kraemer et al., 2001), it is important that loaded march training programmes embrace this. Further, the intuitive conclusion that endurance-based training should improve loaded march performance to a greater extent for stronger and less aerobically fit individuals than less strong and more aerobically fit individuals is now supported by research evidence (Williams et al., 2004). Therefore, if an individual lacks aerobic endurance and wishes to excel at loaded marching, a training protocol that factors in strength and endurance to build aerobic endurance is critical, as in continuous movement circuit training. If on the other hand an individual lacks strength in the core muscles, upper back, hips and thighs, a more traditional training protocol that includes strength and endurance to build general strength (resistance training) is more appropriate (Williams et al, 2004). Meta-analysis by Knapick et al. (2012) supports, and builds upon Williams et al’s (2004) research, that some combined modes of physical training can considerably improve load marching performance. Substantial training effects were apparent when progressive resistance training was combined with aerobic training and that training was conducted at least 3 times per week over at least 4 weeks. When progressive load marching exercise was part of the training programme, much larger training effects were obtained. Field-based training that combined a wide variety of training modes and included progressive load marching exercise was also very effective in improving load marching performance (Knapick et al., 2012). Aerobic training alone or resistance training alone had smaller and more variable effects, depending on the study. The largest overall improvements in load carriage performance were found when once weekly progressive load marching exercise was part of the training programme. This follows from the exercise principle of specificity whereby gains in physical performance are the greatest when individuals systematically exercise with the task in which performance improvements are desired (Knapick et al., 2012). Knapick et al. (2012) argue that progressive load marching exercise likely involves the skills, muscle groups, energy systems, and related components of fitness that were important for the performance of this task. However, Knapick et al. (2012) also noted that physical training without load marching was also successful in improving load marching performance, albeit to a lesser extent. Effective gains in load marching performance were seen with just resistance-aerobic training (for the most part, running), suggesting that the combination of strength and cardio-respiratory endurance are important fitness components of an overall programme to improve load marching performance. 6.0 Loaded Marches for Fun! Much of the published research investigating the physiological, biomechanical and psychological impact of load marching has studied young, fit males carrying loads for an hour or less. The resultant body of knowledge may not be appropriate to the increasing numbers of middle-aged and older men and women who are taking up or returning to tramping as a recreational activity. In a study by Lobb (2004), members of 11 tramping clubs throughout New Zealand were surveyed to discover their personal characteristics, characteristics of tramping trips undertaken and injuries sustained. Significant numbers of men and women over 30, 40 and 50 years of age and with generally sedentary lifestyles reported occasional tramping during which they carried backpacks weighing up to 29% of their body weight for more than five hours over 11-15 km/day. Injuries were reported by 74%, with sprains being the most common injury type and knees, ankles and feet the most frequent location of injury (Lobb, 2004); this emphasises the importance of conditioning. Personal equipment and its carriage can be a source of injury or aggravation for the following reasons: new, ill-fitting, non-protected, poorly maintained or poorly packed equipment leading to incorrect weight distribution. Fitness instructors should check this element when monitoring training. Suitability: if lower limb injuries are to be minimised, it is essential that your boots are suitable for the activity undertaken. Nowadays, many boots are specific to a particular activity. The boots must fit correctly and be in good condition. Wear and Tear: worn or damaged boots will not provide essential support and protection for the feet and this may lead to problems throughout the lower limbs and the back. Whilst factors including, the individual’s size and weight, boot maintenance and type of use will determine the life of your boots, those in regular use should ideally be replaced if wear and tear is apparent. ‘Breaking in’ Your Boots: prior to commencing the loaded marches you should purchase at least one pair of boots. It is important that you ‘break in’ these boots by wearing them over gradually increasing distances and periods of time – a process that will also allow your feet to become accustomed to this new type of footwear. During this period the boots do not require soaking in water or any other type of fluid, but should be maintained by simply being cleaned with an appropriate polish. Wet Boots: boots that have been used all day should not, if at all possible, be worn the next day. This is to allow them to dry out fully before adding another day’s puddle. Correct Fit: make sure that your boots fit properly. Any movement of the foot inside your boots can cause a blister. Your foot must therefore be held firmly back into the heel of your boot so that it does not slop around. The toes however, should have room to move and at no time should the boots press on them. This would prevent the toes working properly and make it more difficult for you to walk freely. Socks: Never march without socks and they should not be used two days running. Current thinking suggests you should use two pairs when marching long distances. However, if using this approach, make sure that there is still room in your boots for both pairs of socks and your feet. They can be either two pairs of medium thickness or one thin and one thick pair. With two different thicknesses, put the thin pair next to your skin. Sock Fabric: On the march your feet will sweat. Wear socks made from natural fabrics such as wool or cotton. This will allow sweat to pass through and keep your feet drier. Man-made fibres, such as nylon, do not absorb the sweat and after a few miles you will find your feet swimming in perspiration inside your boots. This is not just unpleasant but can also make your skin soggy and much more likely to blister. Foot inspection should be carried out after any strenuous training such as at the end of the BCFT, ACFTs and any other loaded marches. Remember that serious injuries start as small ones. Luckily the body has a defence against things getting too bad and that defence is pain. Pain is never normal and must always be investigated. Sogginess: can be seen as white wrinkled skin. When you leave a plaster on your finger for a couple of days the skin underneath will be soggy when you take it off. Soggy skin on the feet means lack of drying or ‘unattended’ sweaty feet, and the possible onset of athlete’s foot. Blisters: blisters are the result of rucked socks, badly laced or incorrectly sized boots, poor drying or poorly toughened and prepared feet. Nail length: bruising, in-growing toenails or shedding of the nail may occur unless nail lengths are correct. Corns and callous: callous or harder skin is formed as a protection against stress and therefore should be encouraged. However, a corn is not normal. It shows that a particular area is taking too much load. Corns must never be cut out with scissors or a knife but should be referred to a medical professional. Rub marks: when shoes or boots press onto areas that should not be bearing a load, red rub marks result. Such marks can be caused by improperly fitted boots or shoes, or by bad foot function. Rub marks can develop into scores so the cause should be sought. Painful areas: pain means that there is something wrong and painful areas must always be investigated to prevent future injury. Swelling: after a long march or run, some swelling, which is a sign of overuse, is only to be expected. However, localised swelling when it is associated with pain should not be ignored and its cause should be found and treated. Muscle fatigue is the result of many factors, each related to the specific demands of the exercise that produce it. A significant reduction in muscle glycogen is related to fatigue during prolonged sub-maximal exercise (e.g. individual marching at 70% of maximum heart rate on a BCFT). This is often referred to as nutrient fatigue and occurs even though sufficient oxygen is available to generate energy through aerobic pathways. Endurance athletes commonly refer to this fatigue as hitting the wall. Inappropriate lifting and carrying techniques. Individuals should be aware of any webbing that may rub the skin causing sores and blisters; this often occurs on the shoulders and lower back. Any dull or severe pain in the back or neck which is increased with movement or possible pain and numbness or tingling sensation radiating down the limb should be discussed with your fitness instructor or a medical professional. Kraemer, W.J., Vogel, J.A., Patton, J.F., Dziados, J.E. & Reynolds, K.L. (1987) The Effects of Various Physical Training Programmes on Short Duration, High Intensity Load Bearing Performance and the Army Physical Fitness Test. US Army Technology Report No. T30-87. Natick, MA. US Army Research Institute of Environmental Medicine. Kraemer, W.J., Mazzetti, S.A., Nindi, B.C., Gotshalk, L.A., Volek, J.S., Bush, J.A., Marx, J.O., Dohi, K., Gomez, A.L., Miles, M., Fleck, S.J., Newton, R.U. & Hakkinen, K. (2001) Effect of Resistence Training on Women’s Strength/Power and Occupational Performances. Medicine and Science in Sports and Exercise. 33, pp.1011-1025. Williams, A.G., Rayson, M.P. & Jones, D.A. (2004) Training Diagnosis for a Loaded Carriage Task. Journal of Strength and Conditioning Research. 18(1), pp.30-34. Knapick, J.J., Harman, E.A., Steelman, R.A. & Graham, B.S. (2012) A Systematic Review of the Effects of Physical Training on Load Carriage Performance. Journal of Strength and Conditioning Research. 26(2), pp.585-597. Lobb, B. (2004) Load Carriage for Fun: A Survey of New Zealand Trampers, Their Activities and Injuries. Applied Ergonomics. 35(6), pp.541-547.